Vichy is fast becoming one of my favourite skincare brands. Everything I try, I love. Their three new masks are no different. This mask is just brilliant. It's really purifies the skin and makes it feel very clean, but still hydrated. It's actually quite emollient which I wasn't expecting. It applies really easily but it's also very easy to remove. You don't have to tug at the skin at all. The mask also contains Mineralizing Thermal Spring Water so it does leave the skin feeling nicely hydrated. Although directed at oily skin, I think it would be suitable for all skin types. I've found that the mask really helps when I'm breaking out. It calms everything down and stops anymore spots from coming through. I was most intrigued by this mask because you just don't find masks containing AHAs at this price point. The mask is full of chemical AHAs from different fruits which work to remove any dead dull skin cells. What's different about this mask is that it also contains a physical exfoliator made of volcanic rock, hence the double glow part. It's very gentle and doesn't irritate the skin either. My skin feels really smooth and looks so much brighter and clearer after I've used this. For all my dry skin gals out there, this is the one for you. In fact, even if you have oily skin, this is a great mask because the texture is so light. It feels almost like a jelly which makes it very cooling upon application. I think I might try putting a bit in the fridge then using it because it would be brilliant if you have very intolerant skin. I like to use this overnight so that my skin gets a good dose of hydration. It contains ingredients such as glycerin and Vitamin B3 which help smooth the skin and make it look healthy and supple. The masks are £14 each, but I managed to get them for around £9 during French Pharmacy month on escentual.com. Saying that, I would definitely purchase all three full price. 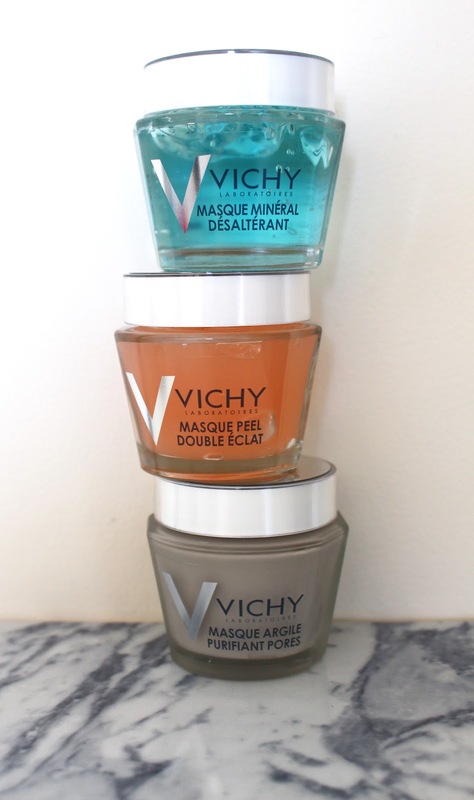 They're brilliant masks and once again Vichy has impressed me. I think if you have all three, you've pretty much got your face mask wardrobe sorted. What are your thoughts on these masks?